City Council Speaker Christine C. Quinn. Presumptive mayoral candidate focuses on solutions to the “middle class squeeze” in speech. On February 11, 2013, City Council Speaker Christine C. Quinn gave her final State of the City Address. Speaker Quinn, who is term limited at the end of this year, is expected to announce her candidacy for mayor in September’s Democratic primary. Quinn’s speech focused primarily on helping the middle class. The Speaker highlighted The Middle Class Squeeze, a report that she and the City Council issued earlier that same day. The report explains that the City’s middle class has shrunk due to decreasing middle-class jobs, increasing middle-class unemployment, the expensiveness of the City, and rising housing costs that exceed middle-class incomes. 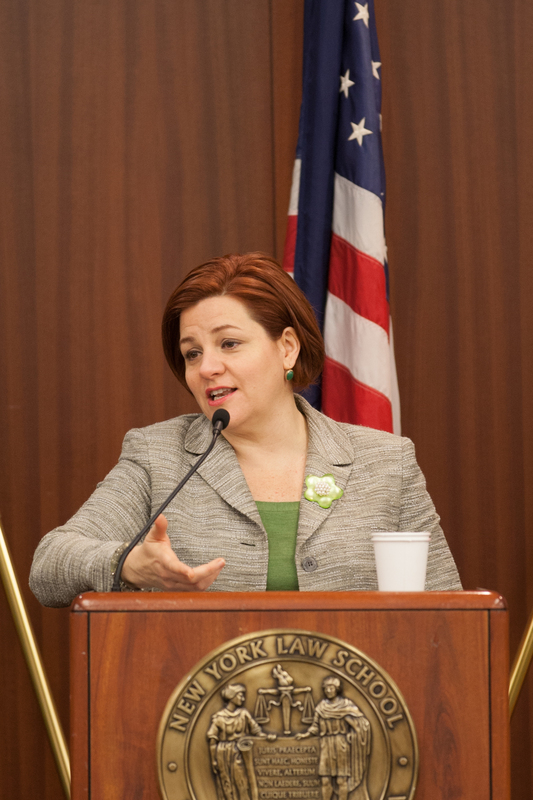 In her speech she stated, “Our top priority must be to keep our middle class here, attract new middle-class families, and give every New Yorker the opportunity to enter the middle class.” The Speaker contended that New York faces an affordability crisis and the City needs to make sure that people who want to stay here can afford to do so.